Tag line: "Two Tall Tales by the world's top story-tellers in one hilarious All-Cartoon Feature!" 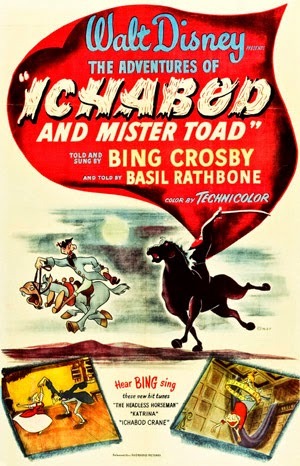 The Adventures of Ichabod and Mr. Toad is a 1949 animated Disney anthology featuring two short films: an adaptation of Kenneth Grahame’s children’s book The Wind in the Willows and a telling of Washington Irving’s classic story The Legend of Sleepy Hollow. Narrated by Basil Rathbone, The Wind in the Willows introduces us to J. Thaddeus Toad (voiced by Eric Blore), a wealthy eccentric whose wild ways have pushed him to the brink of bankruptcy. The situation is so dire, in fact, that his friend Angus MacBadger (Campbell Grant), who’s attempting to put Toad’s accounts in order, fears he may lose Toad Hall, the spacious estate that’s been in his family for generations. With the help of Rat (Claude Allister) and Mole (Colin Campbell), McaBadger tries to subdue the out-of-control Toad, who, along with his new horse Cyril Proudbottom (J. Pat O’Malley), is tearing up the countryside. Things go from bad to worse when Toad is arrested for stealing a motor car. During his trial, Toad (representing himself) sets out to prove that a pack of shifty weasels actually stole the car, something he didn't realize when he bought it from them (having no cash, he instead signed the deed to Toad Hall over to the weasels). In spite of the evidence, Toad is found guilty and sentenced to many years in prison, but Rat, Mole, and Cyril refuse to take this injustice lying down, and hatch a scheme to both spring their friend from jail and, if possible, win back Toad Hall form the weasels. Next up is The Legend of Sleepy Hollow, as told by Bing Crosby (who sings a few songs along the way). Teacher Ichabod Crane rides into the small New England town of Sleepy Hollow, where he’s to serve as the schoolmaster. Shortly after his arrival, he meets Katrina van Tassel, the beautiful daughter of a rich landowner, with whom he immediately falls in love. This incites the wrath of local bully Brom Bones, who also has a thing for Katrina. During a Halloween party thrown by the van Tassels, Bones tries to frighten his romantic rival by telling him the story of the Headless Horseman, the ghost of a soldier that rises from the grave every Halloween to search for a new head. After the party, as the overly-superstitious Ichabod is on his way home, he encounters the dreaded Horseman, who pursues the schoolteacher through the dark woods, determined to make him his latest victim. Though I’d never seen the movie before, The Adventures of Ichabod and Mr. Toad wasn’t an entirely new experience for me; years ago, I was able to check out The Legend of Sleepy Hollow when it played on TV. That said, I was very impressed by Disney’s take on The Wind in the Willows, which is a lively tale with likable characters and a few exciting situations (a late sequence, where the four friends try to get the deed back from the weasels, is a lot of fun). The Legend of Sleepy Hollow, on the other hand, doesn’t hold up quite as well. The middle portion of the short drags terribly, and not even the smooth sounds of Bing Crosby singing songs like “The Headless Horseman” ("Now, ghosts are bad, but the one that's cursed... is the Headless Horseman, he's the worst") can save it. The moment Ichabod Crane rides into that forest at night, however, The Legend of Sleepy Hollow springs to life in a big way, providing more thrills (and scares) than we’re used to seeing in a Disney film. This sequence alone makes The Adventures of Ichabod and Mr. Toad a worthwhile experience, but combine it with the breezy entertainment of The Wind in the Willows and you have a lesser-known Disney effort that deserves a much wider audience.